Silver Tones Smile Album reviews. Silver Tones Smile marks UltraBabyFat's major-label debut (on Velvel records). This alternarock band started out as Babyfat, but became UltraBabyFat with the release of this album. (Their first album was an Indie record, released 1995, entitled Dragons Go Away). Upon being picked up by Velvel, they appropriated the talents of Keith Cleversly (Flaming Lips, Hum) among others to take care of production. The new album was recorded at Easley Studios, where, incidentally, some of the band's favorite artists such as Pavement and Jon Spencer Blues Explosion recorded. 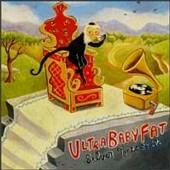 UltraBabyFat considers themselves a live band above all else, and this is apparent on the album. There is an inherent rawness found within, however it is coupled with the necessary production which is found on any quality studio recording. Guitarist / vocalist Michelle DuBois states "Live, we don't play with huge amps -- we have a more lo-fi sound in our shows and we wanted to translate that in the studio". The album sounds nowhere close to underproduced, the grit of the band shines through - hopefully this is what the were looking for, as the sound is excellent for setting the mood of their work. The band is classic female alternative rock. I can best describe their sound as a mix between Juliana Hatfield, Hole, and Veruca Salt (the vocals sound very Courtney Love when they get coarse). The instrumental aspect of the band is a lot lighter than the female rock of Hole - thereby sounding like a mix of Hatfield (a la Juliana Hatfield Three days - not the solo stuff) and Veruca Salt. The only complaint I have as to their musical style is the similarity in riffs to other works I have heard. If you listen to the first track, "Twist", it sounds very similar to Better Than Ezra's "Rosealia" (from Deluxe 1995, Elektra Records). Otherwise the band has talent in all areas. Happily it is not only simple power chords, there are even a few solos. "Jonesin'" includes well as a funky bass intro on (my favorite track on the CD). The CD is quality stuff - nothing I am gonna go out and tell all my friends about, but it may get the casual mention in conversation. The band should be happy with the CD - check it out if you get a chance.